Last week, the lovely Whitney of Whitney in Chicago made granola. I commented on her blog that it looked delicious, to which she responded "let me send you some!". Yes please! It arrived at the end of last week and was enjoyed as cereal with soy milk, on top of greek yogurt and, most commonly, by the handful while staring into my pantry trying to decide what to make for dinner. That was my favorite way to consume it. 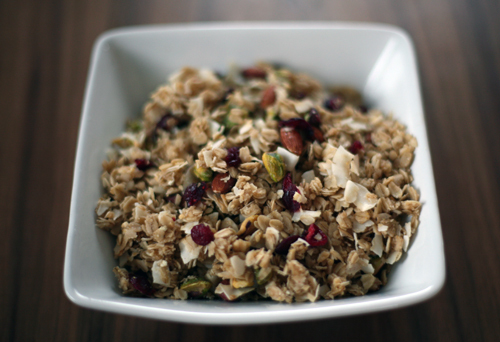 It is chock-full of pistachios and cranberries, along with almonds and coconut flakes. Delicious. Thank you Whitney! Granola is one of those grocery store items that I hate to buy. It is somewhat expensive and every time I pick up a box or scoop some into a bulk bag I think to myself "I should just make my own!" My good friend Beth sent Brian (my hubb) and I a batch for Christmas which was consumed quickly and similarly to Whitney's. Since then I've had granola on my to-make list, and the arrival of Whitney's package secured its spot at the very top of that list. As I've written before, its spring cleaning time. I've been working through the containers of dried fruits and nuts in my pantry, cleaning out items that have been stored for far too many months to make room for new purchases. 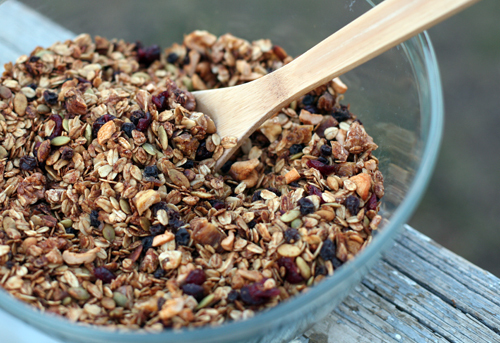 Granola seemed like the perfect way to use up the small quantities of miscellaneous dried goods that I had left. I dug around and found currants, cranberries, apples and pineapple along with walnuts, pumpkin seeds and a small amount of finely shredded unsweetened coconut. 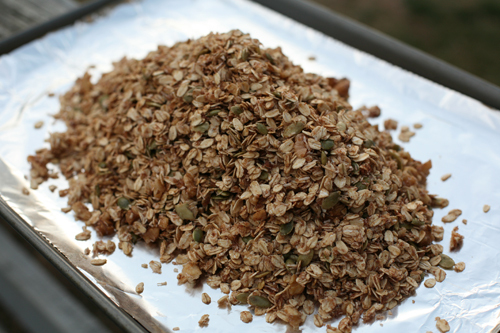 As I gathered my ingredients I eagerly pulled up Whitney's recipe to make sure I had what I needed for the granola base. One item on the list stirred a recent memory of a white, flour-like substance that I had been storing in a small gladware container. It had been in the pantry for months and I had been trying to remember what it was. I knew that I had opened a box of something, used a good portion of it and stored the remainder in this container for future use. The only problem? I hadn't labeled the container, and I had no idea what the substance was. Just last week, during my initial cleaning out of the pantry I had stumbled upon it and, exasperated that I coudn't remember what it was, I threw it out. Now I remembered. Powdered milk. And, of course, Whitney's recipe called for it. And I, the non-labeler, had none. I quickly decided that powdered milk must not be an absolutely necessary ingredient in granola. My reasoning? 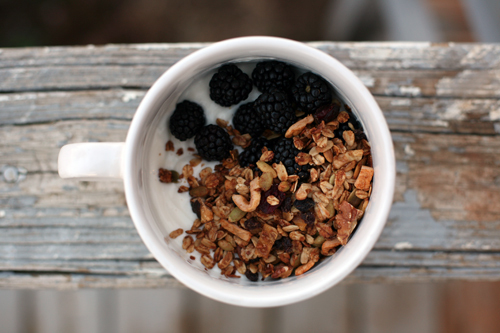 Everybody loves granola, including Vegans. And a granola that contained powdered milk would not be vegan so powdered milk must not be necessary. This means that honey must not be absolutely necessary either but I chose to keep it in, because I do love honey. For my kitchen sink granola (or should I say pantry shelf granola?) I decided to hop over to The Kitchen Sink, remembering that I had seen Kristin feature granola a few times on her blog. And her recipe didn't require powdered milk. Ding ding! I modified the mix to include the items I had on hand, but the base recipe is the same. And it is delicious. Store-bought granola? A distant memory. Preheat the oven to 375*. Line a rimmed baking sheet with aluminum foil. 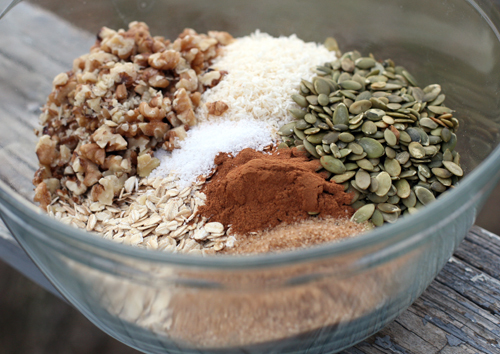 In a large bowl, combine all of the ingredients except the dried fruit. Stir well to incorporate. Spread the mixture on the prepared baking sheet in an even layer. Bake for 20-30 minutes, depending on how golden you like it (I baked mine for 20 minutes). Stir every 10 minutes. 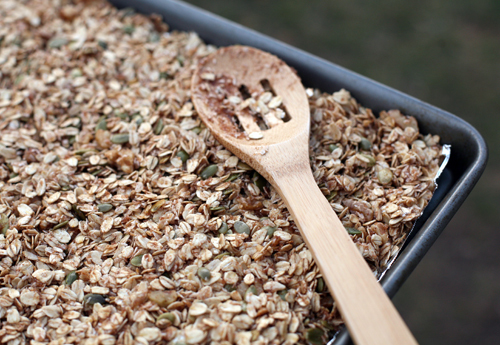 Remove the granola from the oven and cool completely, in its pan on a wire rack. Once the granola is cool mix in the dried fruit. Jenn of Eating Bender just had her 1 year Blogiversary, and to celebrate is hosting a fun giveaway! Congratulations Jenn! HangryPants is giving away a Lexan Healthy Juicer! Fun!!! Have you been reading Kath's posts about her trip to Africa? Amazing!